Hey so iv noticed this app where they pay you to pick up large stuff like sofas. Iv not got a car or van but was wondering of I could fabricate a bike trolley large enough to carry sofas. 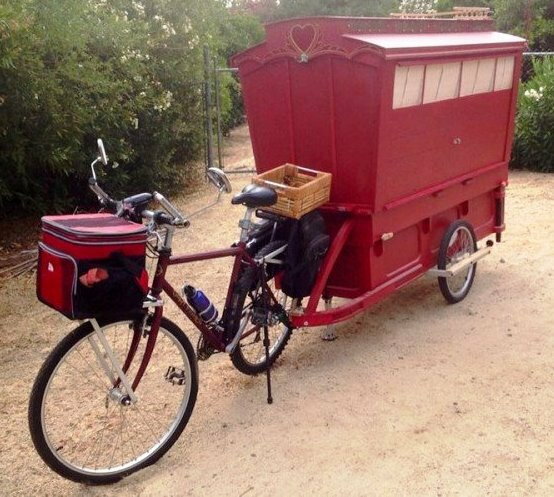 Or would a cargobike be able to carry such bulky items. Was thinking maybe 2 bike trolleys that can carry 100kg connected together with wood. I built my own "heavy hauler" a while ago. Aluminum welding which was a major pain. I need to practice more as I think I'm figuring out why I was having so many issues (trying to run a bead rather than a string of puddles). The original plan for the trailer was a bi-layer frame with an upper section that would be flat, and large stuff could overhang the wheels. Frankly, I use the cargo bike more as a tow machine than for hauling, so my next incarnation will be specialized just for towing. I do prefer a more typical kid's trailer for more compact stuff, and have one that I've gone "skeletal" with. I had intended to strip and rebuild, but it turned out that the fabric floor and sides of the kid's trailer works well for most of my hauling. But, for some bulky things, if it fits on the kid's trailer frame, I'll just take a bare frame. Another plan was to make a telescoping frame using aluminum tubing that would slide into or over the tubing for the kid's trailer, but with the "heavy hauler", it hasn't been a high priority. Bikes: 2006 Falcon Explorer Hybrid, 2008 Landrover Visalia Crossover, 2010 Cargo Cycles Senton, 2010 Cargo Cycles Capability, and a 2001 AVD quad pedi-van. If you have basic steel fabricating and welding skills why not build a licensed Carla Cargo Clone: Bauanleitung Carla Cargo Crowd ? postfossil mobil It is made mainly from ⅝"& ¾ 16 gauge/1.6mm thick mild steel box section. It is economical to build along with being both reasonable light and strong, and the third "tricycle wheel will give additional stability when loaded and is a good starting point for an electric drive conversion. However, you may need to use google translator because it is written in German. Last edited by Gareth; 04-17-19 at 11:51 PM. somebody makes a big bike trailer. is it called "people who bike"? when i do the mayors bike ride here in the city one of the bike shops brings one for helping riders who break down during the ride. looks a little like an aluminum ladder with wheels and a bike trailer hitch. edit: got the name wrong. it's called "bikes at work"